These are very common keywords and are quite confusing. So today we will discuss these keywords and try to understand them. Const is nothing but "constant", a variable of which the value is constant but at compile time. And it's mandatory to assign a value to it. 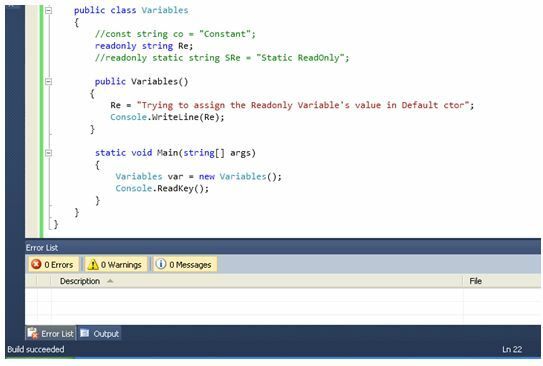 By default a const is static and we cannot change the value of a const variable throughout the entire program. 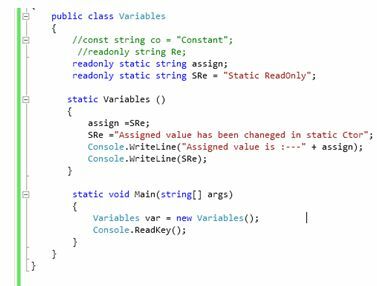 Here I have created a class named Variables and defined all three variables, so first let's play with const. Here I tried to de-initialize the const variable, it gaves me an error like "A const field requires a value to be provided". 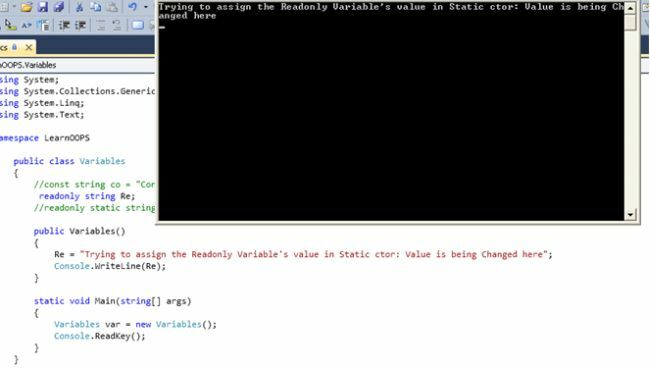 Ok now I initialize a value for this variable and try to change it further in the class. Here I have created a static constructor, default constructor, parameterized constructor and a Simple Method. I tried to change the value of the const variable everywhere but once I assign the value, I am unable to change it again since when I do it gives me a compile time error as you can see in the snapshot above. 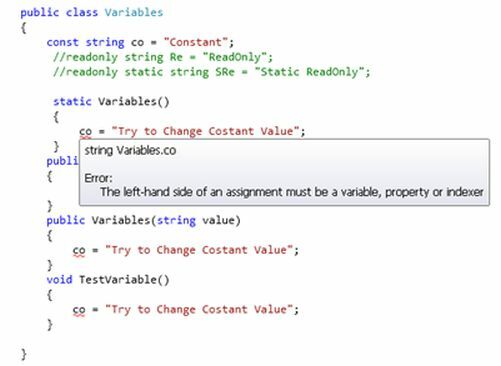 Here, it is also giving an error that you can only assign a value either through a variable or a constructor. 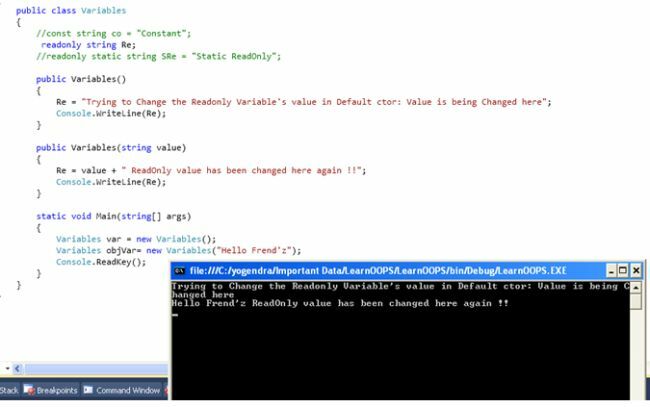 Now try to change the value in the default constructor. Now here we can see that there is not a runtime error and the value was assigned successfully to the Readonly variable. Now one gotcha is, now that you have assigned the value, can you change this value again ??? Let's try to change the value again. 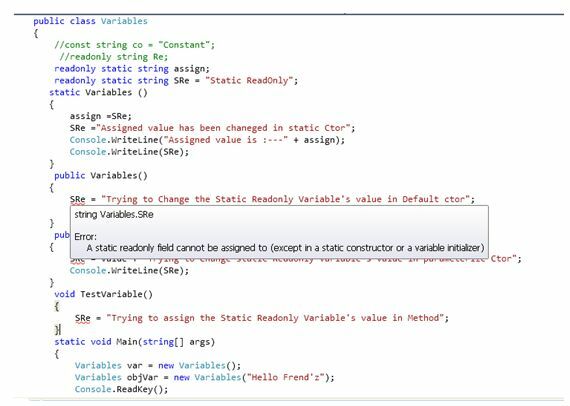 A Static Readonly type variable's value can be assigned at runtime or assigned at compile time and changed at runtime. 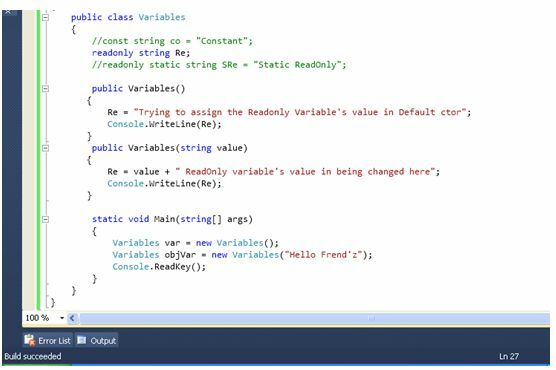 But this variable's value can only be changed in the static constructor. And cannot be changed further. It can change only once at runtime. Let's understand it practically. As you can see in the above, I created Default, Parameterized Constructor and Method and tried to change the value again here. But I am getting a compile time error for all.